Sunday we (two friends and myself) decided to go for a walk along the Donaukanal, after a stop at Eis-Greissler near Schwedenplatz. We started ‘at’ the Twin City Liner (where you’d normally get on the boat to Bratislava), went down the stairs to the promenade, passed by Strandbar Hermann and Hafenkneipe g.maqroll and took a u-turn back to Schwedenplatz. Quite a walk. And a very interesting one too, for graffiti-lovers. Nice day and some time to kill? 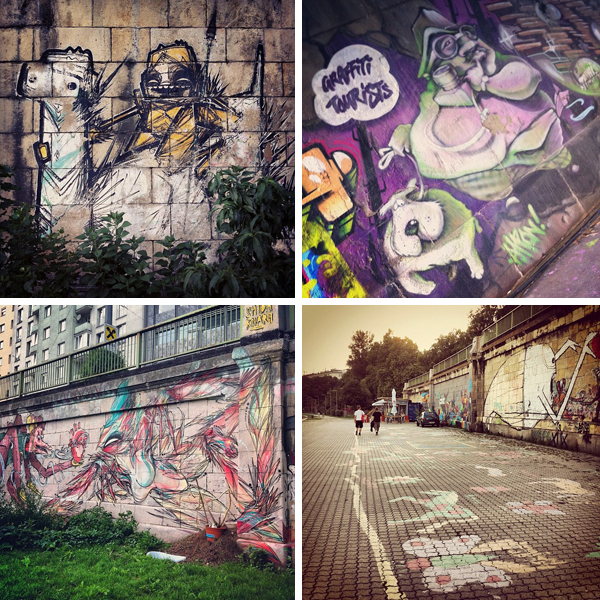 Graffiti heaven is waiting for you! Make sure to stop for a drink and a photobooth-moment with your fellow walkers at Strandbar Herrmann! Sneak peak? Take a look at my Instagram stream.